Multiquip’s – Whiteman Chemical Sprayer WSC55BM (starting price shown below) or WSC55 (Kit w Pump, Cart, Wand & Hose – model we stock) – Barrel Mount & Concrete Sprayers with a high performing 18 gpm. Chemical Spraying System offers significant time and cost savings. 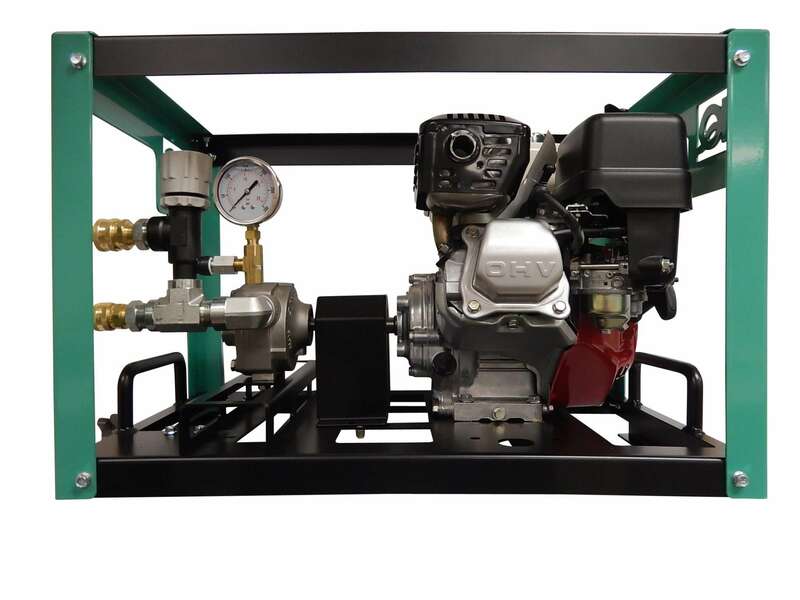 A small on-board compressor allows the operator to clear and recycle the leftover product that would normally be discarded, greatly reducing maintenance and waste. See below Brochure for additional details and the video link to Construction Pros. Two big pluses 1) Larger Honda Engine 2) 18 gpm vs a lot of the competition at only 7.5 gpm. Pic is of the WSC55 Kit w Cart. Please select between the two models for the price including freight to a Commercial address with offloading by the customer*. Below prices are based on a drop ship from the mfg and are subject to mfg lead time. If needed sooner, we do carry the WSC55 in our physical inventory and can ship same day**, please select the Ship from Patriot option. We welcome a call or email (Equipment Quote Request Form above) to revisit a price (even if one is posted) based on your freight location, qty, options, payment method, etc as all of these factors effect a final price. Please obtain another price or two on the parallel model and options prior to contacting us so you can be prepared to recognize the savings and move forward with a commitment to save you hundreds, if not thousands. Most of our larger equipment posted prices (unless otherwise noted) are based on a wire transfer, include a freight allowance and customer offloading. Powerful 5.5 HP Honda GX160 gear reduction engine provides reliable operation. Quick disconnect hose connections for simple operation. Sloped chemical platform allows all liquid to be easily dispensed from any container. Holds one 55 gallon drum or up to four 5 gallon containers. Tow handle allows unit to be moved on the jobsite by hand or forklift. Parking brake to secure unit on unstable or uneven ground. 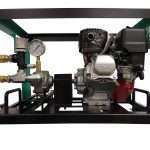 Engine-driven compressor for recycling any leftover product remaining in the system back into the original container. Convenient work tray holds tools and other on site needs. Gripped control handles for operator comfort. Smooth tires have no tread to reduce the risk of floor damage. Single front tire for easy steering and control. Built in hose rack accommodates up to 150 feet of hose. No Compressor is in this model.